It takes a little getting used to reading this book, because as the cover says it is a script for the play which began in London on 31 July 2015, which was incidentally "Harry's Birthday" and also launch day of the book. Harry Potter and the Cursed Child centers around not Harry, but his younger son Albus Severus Potter. Harry, is of course, a primary character - but not THE primary character. We see lots of familiar faces within the story, from Harry, Ron, Ginny and of course Hermoine to Professor McGonagall and Draco. 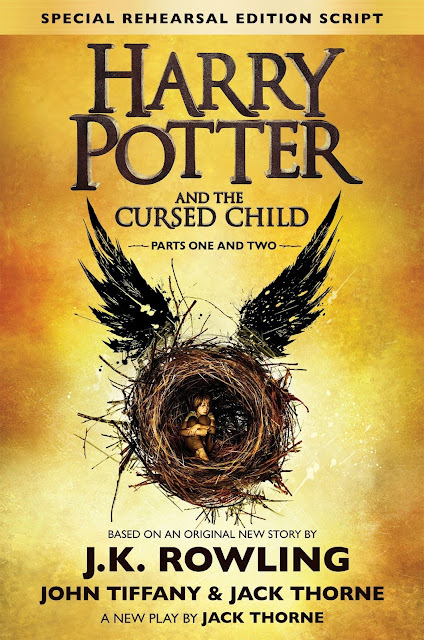 I have to confess that I haven't actually read the other books in the Harry Potter series, but I have seen the movies and Harry Potter and the Cursed Child ties up a lot of loose ends. There are some surprising twists and turns within the story, which makes it different enough to be interesting - but lots of people and places referenced from the previous books to make it familiar. I thoroughly enjoyed this book and recommend it to anyone who is a fan of Harry Potter or of J.K. Rowling's work.